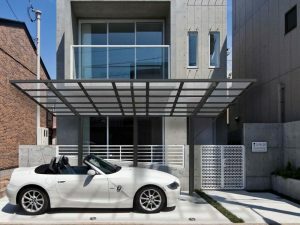 New from Ryterna, is this fantastic looking top of the range carport that combines modern aesthetics with dependable design and sturdy materials. Ryterna were established in 1993, in the picturesque riverside city of Kaunas, in central Lithuania. Normally specialising in entrance and garage doors, and now have taken their expertise to other markets including mobile homes, containers, and now car ports. The company has grown massively, manufacturing over 80,000 doors alone each year, and employs over 450 people. Alongside this, they have offices in Italy, Germany, Russia, China and more. 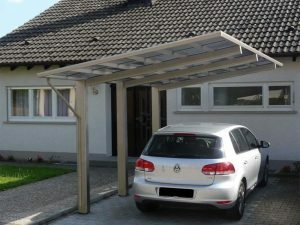 The fantastic and modern looking Ryterna carport will look at home on even the most expensive properties, and won’t look out of place on almost any kind of home or business. 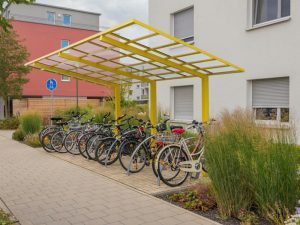 This unique and stunning system can be used for multiple reasons, from shading and protecting cars to protecting bikes, and even being used as a glass roof system. 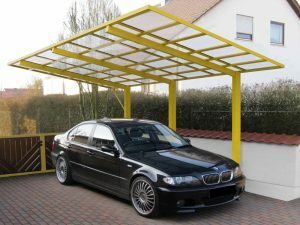 Carports are of course mostly used to shelter cars from rain or snow during the colder months or spells. Not only can they shelter cars however, but they can also protect bikes, vans and even the pathways and areas beneath the system ensuring no slip hazards. The use of the glass or polycarbonate (system depending) helps to keep the area underneath illuminated and light, yet stops snow or rainwater from gathering, freezing or causing a hazard. For more information, see our Carport page. Ryterna Carports are made of only the highest quality materials. 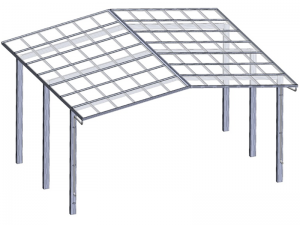 The aluminium frames are sturdy and reliable, whilst the transparent polycarbonate roofing sheets ensure a corrosion resistant system with a long lifespan. 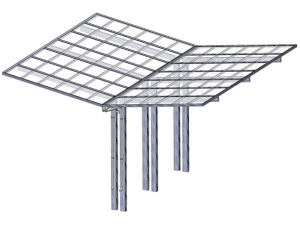 The frame itself is supported by three posts on the lowest edge that help keep the system stable yet never restrict usage or take up too much space underneath. The frame is powder coated and can be painted any RAL colour which allows you to correctly match the aesthetic style of your property, or simply make a statement. The frame incorporates in-built gutters and integrated drainage systems. These help channel rainwater away and distribute it towards the ground, meaning that no splashing water will mark your car or vehicle in anything except from the worst weather conditions. 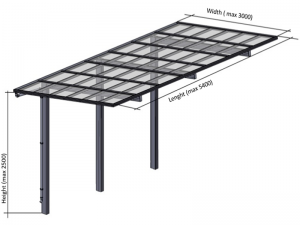 The diversity of the Ryterna carport allows for the systems to be coupled in a number of ways in order to cover greater areas and protect multiple vehicles at once. Above are two examples, Which Ryterna have called the “A” connection and the “V” connection. For more information, check the PDF below or please contact us.